Be sure to go back to my blog post for info on how to calculate the page count. https://scrappystickyinkymess.wordpress.com/folded-book-templates/ has links to two different posts for how to do this. Be careful to count the alternating folds correctly! already sent the Zaine one based on another request. Did you get it? I’d be most grateful if you would send me a “scott”. My husband is a police officer. He was just promoted to the position of SRO, school resource officer. He asked me to decorate his office and I think he’ll love the time and effort that will go into a folded book. I also would appreciate one that says “game of tomes” it’s the name of my daughter’s booktube channel on YouTube. I know it will be small but I’ll find a book big enough no matter how many pages you decide on. I like the font that you used on the “jack” pattern. I’ll be happy with that for both patterns and all lowercase for both please. Thank you very much in advance!! Hi, please could you do a template for the word ‘Bushby’. 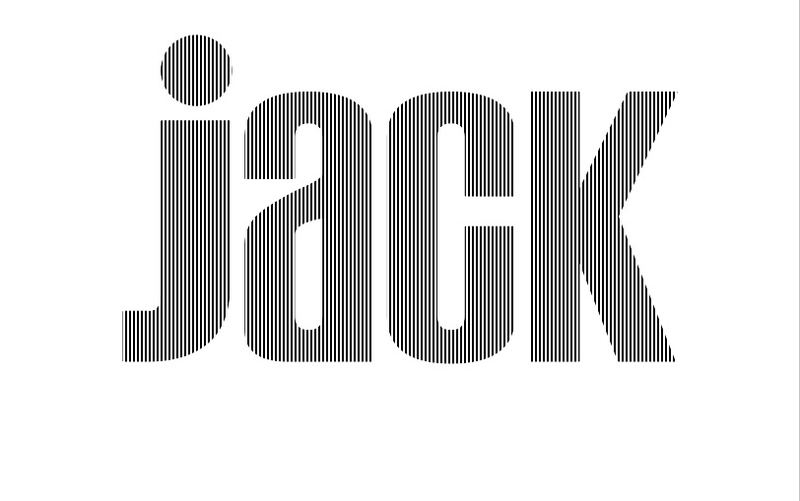 In a similar font to the word Jack on your website would be great. 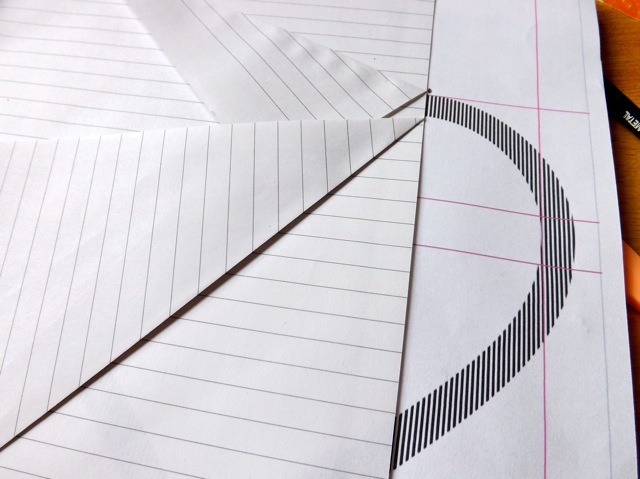 I’ve done a couple of folded books before and it’s always the templates that I struggle with. The book is around 375 pages. Thanks. So sorry, not sure but did this one fall thru the cracks? Check for an email from me and let me know! May I use these instructions for the bookfolding program I have put together at my library? I’ll make sure to put the name of the blog and a link on the instructions I pass out. TIA! As a librarian myself, happy to oblige 🙂 Watch your in-box…. Hello! I was wondering if there was any way to get a Simba pattern. The symbol not actually Simba. My friend is having her baby nursery done in Simba and requested one! I have made a few book folds because I learned how on this website. I have also made a pattern before but I do not remember how I made it. By symbol do you mean image? Like a picture of Simba? If you find one you like I can make it into a pattern (although I may have to simplify it a little to make it work. If you don’t mean a picture but some sort of African symbol that means Simba, again, I’d need to see an image of what you mean. Just add a link or email me the info! The symbol that looks like that! Thanks! Hi I’m new to book folding and so far I love it. A friend ask me for a book for her birthday and I have no idea yet how to make patterns. Can you help me create one. It needs to say Lacy & Corderald. I wold appreciate it greatly. Lordy, that s a very long “name” for one book. I will send you two – one with Lacy & and one with Corderald and suggest you do them as a pair. And if you want to do just the names you can simply leave out the &. I really love this! I did the Deathly Hallows as my first fold, definitely need some practice! Would you be able to send a template for the name Kelly in whichever font would be easy lol and if possible one of the state of Florida? Thank you so much for all the work you put into this site and how helpful you are!! Hello! 🙂 I have never done book folding before but am looking to make one for a friend for his sobriety anniversary .. looking to do just the date of his anniversary “1-09-18” with just circle bullet points between? Would it be possible to get a template so I can try it out? They are selling them on etsy for 95.00 but I would like to give it a go myself before I go that route! Whatever font might be easier I’m good with! Haha. I have done a state shape. Outline might be a bit difficult to do n other than a small size. Check your mail! I checked my email and I don’t see your email. I did but the email is the same so it is likely your email bounced it – check your spam folder! Hello, what you are doing is amazing! I found this on Pinterest and in love with the idea but don’t know how to make the templates. Any chance you can make a few templates for me? I am looking for “VICKI”, “CHAVEZ”, and “SANTOS”. I greatly appreciate any help you are willing to offer. These look like greats gifts! this will be on the way in the next hour or so! Thanks for taking the time to work on them. I haven’t received them and also checked junk so was just wondering if you had sent them out. Thanks. Would you be able to do a template for the date 13.10.17 but with hearts instead of dots if that’s possible. That book im using has around 400 pages but I can change it if needed. Could I have it in the font Bernard MT. Thanks again, it’s a huge help! I sent this to you at 11:06 yesterday! I am happy to make a template but my guess is that a long “phrase” like that is going to be very small on a small book. 278 pages is small. Also, I DO NOT fit the free template to a specific size book. There are people who will do that, but they will charge you to create a Bookami style measure and mark template. What *I* do is create the template, you count the lines and find a book that will work. Just to let you know. if you have the time. Any reasonable size or attractive font will work just let me know what size book I will need to build it and I’ll purchase one. Hoping to find a good one with love in the title. PS very generous of you to provide this to so many people!! Hi, I’ve been admiring book folding for a while having done a few basic trees at Christmas. My brother is getting married in September so I’d love to do him and his wife a display piece. I have a huge 1111page hard back book to use (thinking I can leave some unused at the edges) their initials are M and D so I think I’d like to perhaps do an M with a heart under then a D under that. Perhaps slightly off set from one another or staggered. I don’t think I’ll be good enough to do the date as imagine that’s tricky but another alternative could be to do M & D with 15/9/18 underneath it. I’d be very grateful if you could do me a template. In whatever font you think would look best. Thank you in advance. Of course the 1111pages is the printed number in the book so will be working with 555 sheets. I’m so wanting to learn to do this but I am having trouble with understanding how to use the program to get some words on a template. I’m confused over some have measurements to follow & some have just pictures with lines. I’m looking for a template to make the word READ for one book that has 264 pages & the word BOOKS for a book that has 292 pages. I’m trying & hoping I can do these two books for when school starts in Sept. My daughter is a librarian at an elementary school & I know she & the children would love seeing a book with those words on it. Is there anyway I could inconvenience you into sending me info on how to do that. I’m using childrens books to do it with. I REALLY would appreciate it! Hi, Thanks so much for the easy to understand directions! I am looking for the words the (lowercase) and STORY (uppercase) and a heart symbol to use on three separate books. So when put together they will say heart (love) the STORY. I have books that are 399 pages (for heart), 408 pages for the, and 421 pages for STORY. Theses are going to be displayed in my classroom so the font should be pretty easy to read, so the simpler the better, but I don’t have any specific type of font preference. Can you please make me templates for each? I get how to fold, but the templates are difficult for me to figure out. SaraAnn I’m not picky about the font, just something simple and easy lol. I am still doing them and you should get an email from me very shortly! Mary Anne, thank you so much for taking the time to make the templates I requested! I will take your advice on using multiple books for each word. It actually will make a more spectacular centerpiece at my wedding. A bonus to this: my future husband is loving my new hobby! He is planning to do a book of his own this weekend!! Good Afternoon, I was just wondering if it were possible to make a few templates for me please if possible. Ben – in century gothic maybe with a love heart next to it to fill space? I am completely open to fonts and designs. I get that! I found your alphabet templates (great idea) and used that to make an awesome container to wrap a book gift certificate! Yes, ask me again after the first of the year. I stopped sending out templates for the holidays! Yes, I am, but ask me again after the first of the year. I stopped sending out templates for the holidays! Hi MaryAnne! I would greatly appreciate the name Kelly template when you get a chance please. Hello I am going to give this a whirl since the MMF style I have been doing is limited. Have you made any template for those pesky 2-300 page books? If you would point me to them or tell me how to adjust yours I can get rolling. I DO double the page count of the printouts like sisters don’t I? like it has 180 the book should be 360 pages. There are templates that work with smaller books. 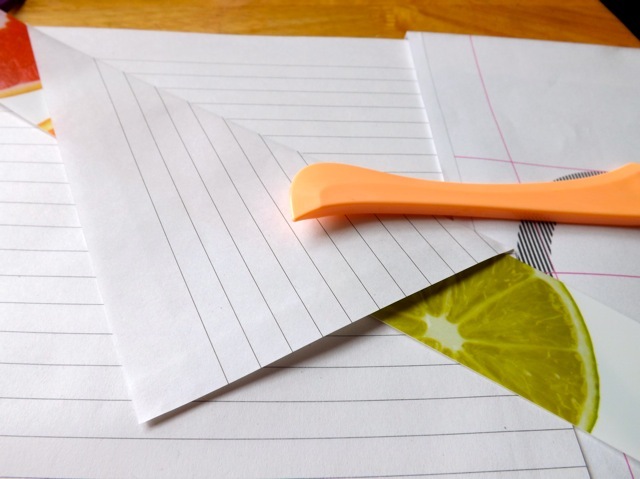 With this style, it means the folded thing (letter, image, whatever) is smaller in height (so 3-4 inches rather than 6-8 inches)to get enough folds to look full. But you could do a single letter or a heart or a circle, something like that. Lots of options for elephants 🙂 Sending you two very different ones to look at! Hello, Mary Anne, I was wondering if it would be possible for you to make me a template for “MUM” in Cooper Black (I think that’s the Font name, it’s for a small book only 18 cm high), I just don’t know how to make a template for “MUM”, how do YOU make a template, I’ve seen some being made on Youtube but don’t have Photoshop or advanced editing software (I’m not very technically minded, Practical yes, but computers are a like a Harry Potter Book to me, full of Magic, many thanks for a great website. Very much appreciated thank you, I will be watching for it, thank you again. Fist of all THANK YOU! I am just beginning to do book folding. I appreciate the alphabet very much. However I would appreciate if you could possibly do a simple beginner template for name ZAC in block letters. My grandson is 10 years old on Nov 30th and I would love to do this as a gift. Thank you for sharing these! My 11 year old daughter has been wanting to try them, she is currently working on a heart. Would you be able to assist in the measurements for the names Krystyn and Lynnsay, we would do them in separate books. With little hearts as the dot in between! Would you please send me a template for J (heart) S. I would like to give this a try. Got your email too – and the template is on the way! Hello!! I have always wanted to learn this and I think I have finally found someone that explained it clearly enough!! Thank you!!! I don’t anticipate it to be quick, but I am hoping to get some practice in and be able to use the Relay one as a fundraiser for the Relay For Life Event that I am in charge of…something new and different! Sadly the book I have didn’t suit the template for “Jack” of which you sent to me. I’ll send a couple of other options …. What a gorgeous site you have here! So extremely glad I stumbled upon it! “Harper” and “Jack” both in the Black Chancery font? Hello there I am desperately looking for an inverted heart pattern, is your open heart the same. When you say “inverted heart” you mean a heart that in concave (inwards) correct? Like this? Hello! I loved your explanation. Could you do a template that says the word déçu please. If the accents are too difficult then normal English alphabet would do just great. This would be a great addition for my group of friends. Thanks for the clear instructions. Maybe there is hope for me yet. I would like an C, L and P, if possible, my grandkids initials. Thank you in advance. https://scrappystickyinkymess.wordpress.com/2016/09/16/more-freebie-book-folding/ has a bunch of READ options, to download! Hello. Are you still being a generous soul to get us going? I would like a template for the word LIRE (French to read). I want to make it as a welcome home gift for my son who has been studying in France for the last 10 months. Thank you so much if you are still doing this for folks…and I completely understand if you’re not. This is going to be my first attempt. If I like the activity and the product I will invest in some software for myself…just wanted to try it out first. I am and I have. I’ve sent two, all upper case as in your request but also mixed case, cause I think it looks better 🙂 Pick which you like! I just want to thank you for your time and talent that you share so generously. I am late to the show, but would love to do this for both of my special needs children’s teachers/therapists for an end of the year gift. I was actually just thinking initials of their last names. I have 17!!!! If this is too much, I completely understand! 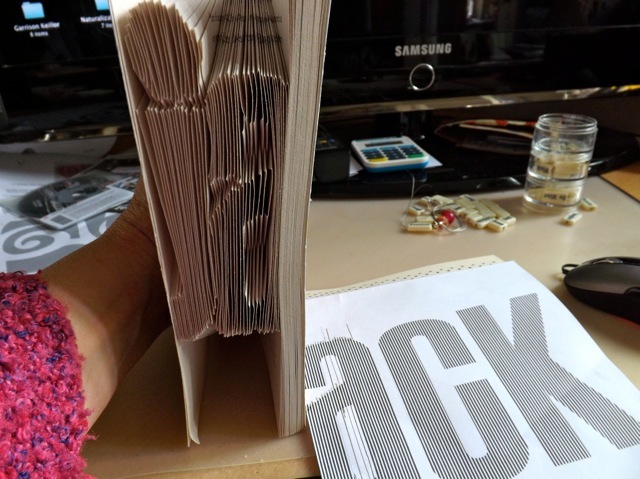 If you just want a letter, look at the posts that include alphabets to print – https://scrappystickyinkymess.wordpress.com/2015/10/08/folded-book-stuff-will-this-work/ is one but click on the Book Folding menu item up top to see others. Thanks for the tutorial! I’ve been wanting to do this for a while. Please do me a template with ‘NeeNee’…. Hi there! Would like to do a monogram letter of E with the Goudy Old Style or Gabriola font. The book I’m doing it on is 8 inches in length so was thinking of a 6 inch letter. Thanks! Is it possible for you to do 2 templates? One on Kaylah and the other on Nguyen. Thanks so much. Can someone help me make a template for “PROM?” I have 450 foldable pages in my book. Hi there! I was wondering if you could possibly send me a template for the name Cobar? I was looking into making one for my friend who is becoming a teacher and thought this would be a great gift. Please and thank you! Hi! Thank you for the explanation – very easy to follow and understand. Also thanks for helping us with the patterns. Can you help me with the patterns for the names : Mihaela, Nicoleta and Alex. I trust your judgement on font. I’d like to order some patterns. How do I go about that? It’s less that you “order” them as yo request them. Just drop me a comment and keep in mind I limit the requests to 3, so I can spread my time over many requests! This is amazing. And my head is spinning, this is really cool! You are so generous to be whipping up patterns for people. Is it possible to make one that says “Books” but the o’s are hearts? This is such a great page! I was actually worried about trying to figure out how to even start!! If you could help me with a pattern for the name.. Liana that would be amazing! I trust your judgement on font! I can’t thank you enough! If there is any way the dashes could be circles, then that would be fabulous! If not, I would still be so, so appreciative! sending 2 versions, you’ll see why…. Love your blog. Thank you so much! In order to give everyone a piece of my time I posted I am limiting the template request to THREE. I’ll do the first three then once you have folded those you can request others. Please send me a template for the names Megan. Audie. Pretty please and thank you!!! Maryanne you are amazing, so talented. My friend loves to read and she is going through a divorce. I would really love to make her a folded book with the words in any font. It’s on the way, but be warned: two line folds are a challenge! Look for my email – I need more info! I am adding a handful of hearts today in preparation for Valentines day – see if one of them appeal to you. All should be pretty easy to fold! Planned on practicing with a basic heart. I have zillions of old books so longer templates on be an issue. I’m a doer so once I can actually sit down and work on the foldo I’m sure I can figure it out. Really want to get at least one done by v day so I would appreciate the templates so I can get folding. There are hearts to download here including the very most basic simple one! I have just run across your blog and I am so thankful! I have wanted to do book folding for a while but it seemed so complicated. You have given me hope. Would you please do the names for my 7 grandchildren (one family – triplets, twins and 2 singles) and the word Christmas. The names are WALKER, JUDAH, ATTICUS, JONAH, WYATT and ASHER – please do all the boys in HELVETICA, The girl’s name is ADDIE and I thought HABANO for her unless there is a prettier one that you feel I could accomplish. I would like CHRISTMAS in a prettier font also unless you feel it would look better in another font. Also I have used all caps to show the correct spelling of each name. I am thinking that only the first letter of each name should be in caps. The same for Christmas. I am most thankful for your help. Could I please pay you something for this? The books I am using are all 568 pages and 7 1/2 tall by 5 1/2 wide. Hello, I’m new to book folding and I’m going crazy trying to figure out how to do the line spacing, can you send me the name –Silas–please, any font you like. Thank you so much. Also do you have a you tube tutorial in how to.make these patterns? No You Tube from ME but there are links to other people’s tutorials in various posts. The ones I used are found in the drop down menu st the top. Template is on the way…. I would love help with a template for the word MAHJONG in all capitals. An Asian font would be cute, but not necessary. Thank you!! In early 2017, sure. But not till then, sorry. Hey, I wanted to create a book folding piece for Christmas but have failed to find how to make a template. I would really appreciate your help if possible, I know it will be a perfect present. I was looking just for the initials “H” and “T” with a Heart inbetween if possible? if not “T&H” would also be great. Thank you very much and you’re certainly doing a really nice thing here. Kindest regards and have a wonderful Christmas. Wish I could help, but as stated in the big banner at the top, I am in a different continent to my computer and unable to help after 12 December…maybe for NEXT Christmas. Or look at the alphabets added and cobble together your own. Hi there can you please make me three templates one that says NTE (all caps), one that says Public Sector and one that says Vicky. Hello :), can you please make me a template that says Josie. Any font that looks flowy/girly and is on the thicker side so its easy to read would be appreciated! My book is 1054 pages long and it is a little shy of 9 inches tall. Thank you so much in advance!! I’m sending two options. But remember, I don’t fit the template to a particular book, other than trying to use my common sense 🙂 I make and send a free template. It’s up to you to count the lines and find an appropriate book. There are people who will tailor a template to a particular book for a fee. I am looking into doing a book sculpture, and have it planned out, but have been having a crazy time creating the templates…the three attempts I’ve made haven’t been evenly spaced and come out looking off (I am doing it by hand)…would you be able to help me out with the templates? It’d be 3 templates with two to three words each. Just say what you need in a comment and if I can do it, i will. If you could do that in Habano ST or something similar I would SO appreciate it!! And I did check everything, spellings and capitalizations are all intentional and correct! I can try but keep in mind that I send the template and its up to,you to count the pages accurately and get a book the right size! There are people who will provide a template to fit a certain book, for a price. You might consider a cut and fold version, which would likely fit in one book. Have you looked at them? I cannot see need to be and. Take a deep breath fitting in anything other than a massive dictionary with 1000 leaves, and even that might be too small! I can. Be on the lookout later today! Hiya Mary. I just saw your email and replied with a photo, yes it was a cut and fold one I wanted to attempt. thank you so much for getting back to me and your site is brilliant compared to any thing else i’ve attempted to follow. In March someone had requested a template for love with a heart for the o…if it’s not to much of a bother I would like to have the same . You are very generous and I thank you in advance!! Xmas around the corner and these are perfect!! I am making a christmas card for a competition, and I came across tthis site, and the book folding is a great place to start. I would love to have the words Merry Christmas, Its Christmas, or something similar, in any christmassy font, I don’t mind! Thanks, very clear. I’m just starting in book-folding, and also prefer to work from a template rather than from numbers. In Photoshop, what I’m doing is setting up the resolution to be very coarse – one pixel per sheet! – and then set up the grid to very fine, one or two pixels per line. You can’t print with the grid on the printout directly, so I screenshot it, and then print the screenshot. Not ideal, but it works, for now. I wonder, is it easier to start with a shape, or words? I would love to try this out – maybe with a big heart, or the word “READ” i think will look really cool! Hi MA! I love that you are helping people to create one of a kind gifts and memories! I am wondering if it is possible to create a template of a face. more specifically, Bob Marley 🙂 Thank you! I can do it, it’s a few more steps but not hard. But even a fairly stripped back face is going to be might hard to fold. I think you might have to consider a cut&fold version. What do you think? Can you please send me a template for the words Star Wars just like on the logo in the star wars font please? On the way, but I think you will find it will need to be a cut&fold rather than a straight fold, because of all the alternating folds! I am a complete novice and have Decided to have a bash at doing this? I would love to make a book with my son’s name (Declan) on it. Would this be too difficult to do for a beginner? This is awesome, I love that you offer this free within reason of request of course! I have tried watching youtube vid’s to assist me in making my own, but to no avail. I would love an “I (heart) you” and a “Davis” template. Preferably something not to formal but no spiral letters I am still a newbie lol. I can’t thank you enough for this service you are offering, it is mighty generous of you! Best wishes… Stephanie from the states! I would love to make one for my sister. Her name is Merri. Such a wonderful thing you’re doing. Thank you! Thank you so much for your help! You are a wonderful Lady! If I can pull this off, it will make a great birthday gift! You’re a blessing! I love these free templates. Its so hard to find good ones online. Thank you. Hallo , Is there any program for parents you are working on ? Can you give me the link of the program please ? 🙂 Thank you . Hi Maryanne, just found you and you are so very generous to supply all these people with free templates. If you’re not too fed up with doing it please could you send me a MR & MRS. And the letters K and M. Also a clue for number of pages as I am a newbie!!! You are truly a generous person and I know that you have encouraged many people like me to “have a go” bless you. I discovered your site today and I’m in love with you work. If you have the time, can you please create a template with J❤️S (a heart in the middle of J and S) in any font that you find most beautiful and e-mail me? I would appreciate if you can also tell me how many pages I would need. I never tried book folding before, but I want to try and make one for my parent’s anniversary. Hi Maryanne! Love the idea. I think it is very very unlikely that I can make a pikachu with that few pages, unless you only want the silhouette, with no features. I’ll do a normal one and the silhouette and you can count them out and see. Hi Maryanne please could you email me the name Wayne in GABRIOLA font. I would be very grateful. I’ll do my best, but Danielle in particular is a long word so it might end up needing quite a big book and still being a bit squat. Let me see what I can manage…. This is SO neat!!!! I am a big Doctor Who fan and I was wondering if you could do the word “Allons-y” ? I love this idea and once I learn how to do it I would love to do my own! Thank you so much!!!!!!! Are you able to convert solid black silhouette type images to a striped book folding style pattern? If so, what type of file does the image need to be? I’ve been struggling to create a pattern for myself as I don’t have any of the appropriate software, even though it seems like it should be easy enough to replace a solid black fill with a striped one 😦 any help you could offer would be greatly appreciated! I can. It has to be a .svg file (or a font character)but I recently found an online converter, which lets me convert any in age to an svg. It is easy with my program but all the Photoshop versions I’ve seen seem really difficult. Have you grab the lined sheet I added and played with that? Hello! I am making a book for my sister and cannot figure out the lines! I would like a sweet cursive of “Lily” if you have the time! How are you? I am trying hard to find the template of my wife’s name “PRAVEENA” but nothing I could find. It would be very helpful if you can send the template of the name “PRAVEENA” for her birthday coming soon. Could I possibly get a masonic symbol one? And are your patterns for specific number of pages? I love your advice – it has been so helpful. I am about to reinstate the Library at a school I work at and will have a lot of books that have outgrown there use so this will be a fabulous thing to do with them at the craft club I am starting as well. I am going to have a go at ‘Read’ I have see listed but wondered if you would be able to do Library for me please? I am on school holidays at the moment so it is an ideal time to have a go and get some samples made ready to inspire the students. You are so generous with your advice and offer to do words – I really appreciate your generosity. I may get the students to try Mum can you advise how many pages this takes and I can make sure I keep books with this amount of pages (and more) . Can you do the shape of Louisiana for me, please? Hi this will be a first for me. Would like to do one for our dance instructor. I can, but with such a long word I think you will find that the height of it will be small and that you will need quite a long book to accommodate the folds. I’ll send you one that has both Danceinline and one that is just Dance so you can see the difference. Him I don’t know if you still make templates for this but if you do I was wondering if you could make ones of emojis. Also if I want to write a word can I just use the letter templates and space them, and if I do how much would I need to space them. I would be really grateful if you could make the template, but if you can’t I understand. Pls email me. Hi, I don’t know if you still make templates for this but I was wondering if you could make some for emojis. Also if I want to write a word can I just use the letter templates and put spacing between them and if I do, do you know how much I would need to space them. I would be so grateful if you could answer my questions and make a template, but if you are busy I understand. Please email me. Would you mind terribly making a template with “J K” with one big heart in the middle? Or three hearts two small on the outside and one larger in the middle? Your choice! Thank you so much for the tutorial! These would make fab gifts for my bridal party, any chance you could send me a template with Bridesmaid and Mum in a pretty font. Josh please? Thanks please email me. for book folding? Thank you, email me when your done. 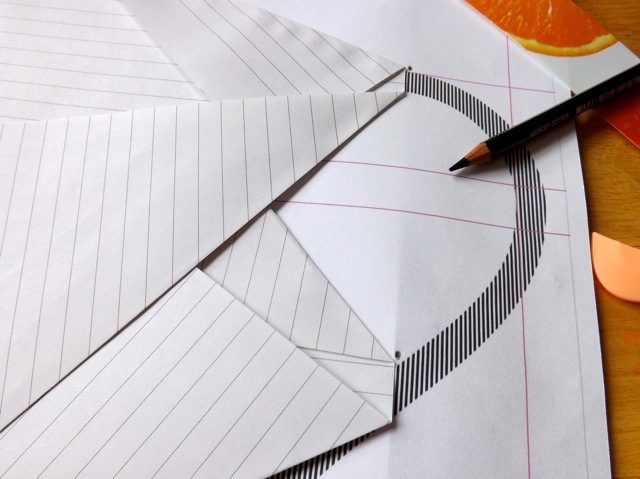 do you know how to fold this pattern? I’ve seen that one before, it’s very cool, but no, I have no idea how it’s done. Try searching the image and see if you can find the original poster and ask them. Maybe they will share! I can, but I can’t imagine you want all five of them to be in the same book – it would be a 2000 leaf book and the hearts and letters would be tiny! Do you mean you want one heart each, big enough for a book? It might work as a cut&fold instead, all 5 in one. I just think there needs to be a discussion about it 🙂 rather than me sending you exactly what *I* think you are asking for and there being NO HOPE of it actually working! hey i would love a template for V&V for my cousin who will be getting married soon. HP in a harry potter font. I would also love some butterfly templates if that’s not too much trouble!! thanks !!!!! Hi, I need templates with a “S” and “Savanna” (font:”Abril fatface”) please. 🙏🏽.I know I can just use the ones you have with all the letters, but I need a bigger size because the letters are too small. And because I have a slow computer that can’t get ‘photoshop’. Any chance you could do the word “inspire” for me or “teach”? Hi I am Hoping you could do a template with Leila on it. Thanks. Please pick a font you think would work the best. Hi Mary Anne. Would you be able to make a pattern for me using my daughter’s wedding date – 7.9.16 and put a small heart centered between each of the numbers? Use whatever font works best. And thank you in advance. This is a great thing you do for people. 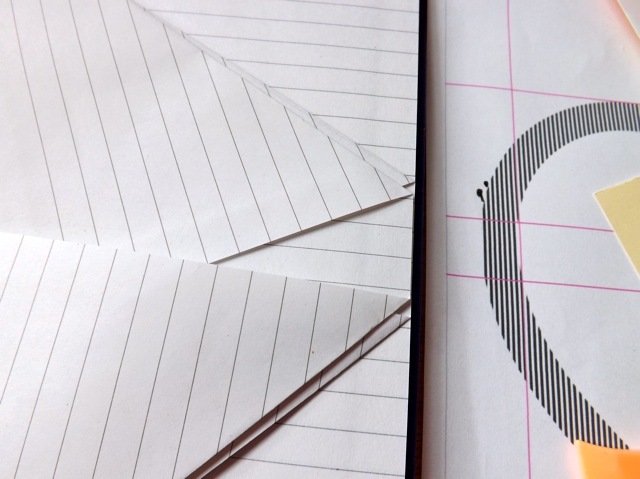 Letters like the e are treated just like the middle of the heart, using alternating folds. Click on Book Folding Templates at the very top and look at the posts linked there. I think that will answer many of your questions and there are also links to templates you can print! Could I bother you to do some templates for me in Britannic Bold please. Could I get a pattern for the heart, ‘love’, ‘zach’, ‘brie’, and ‘smile’. Any font should work. Thank you so much!! I’m ready to give this a try. Please send the following when u r able. Please send patterns for Jordyn, And Tayler. Are u using word to make the patterns? Sending. No I don’t use word – I use a funky, buggy program for the Mac called Intaglio. Your patterns are lovely and so easy to follow. It’s my brothers 1st wedding anniversary soon and I was wondering if you could do me a template with the date 6.6.15 please. Not fussy about the font. Thank you so much! Sorry I didn’t reply right away. I am moving house on Wednesday but I will make sure I send this out to you today. You may be the last one for a while as I won’t have access to my desktop computer, only wireless iPad access, for at least a couple of weeks! Be on the look-out for it. If you don;t see it check your spam folder! Oh my goodness!!! I am so excited. I’d love to try the name Addison. As far as fonts, you pick whatever you think will look nice! Thanks soooo much for sharing all this great information and talent with us!! Could you email me a PDF of just the letters EJW. I have tried and failed to put them together on my own. Thank you! I will send you the PDF but emails bounce sometimes, so do reply when you get it so I know it went thru OK! Seems like it may be possible😩. I want to let my juniors In high School do one that says ‘READ’. I guess we will have to make a template and just jump in. If I understand we need to estimate the number of pages for each letter fold. Guess I need to watch a few more demonstrations. Click the book folding menu at the top, and see the links for counting the fold. Estimates will possibly end in heartache! I can do a specific READ set if you tell be the fonts. https://scrappystickyinkymess.wordpress.com/2016/05/12/yes-i-am-still-here-read-book-folding-templates/ is a new post that has a bunch of templates for you and your kids to try. Have fun! Broadway is not a free font. I found a free one called Broadway Bold that looks very close to it, certainly close enough that you won’t be able to tell when it’s folded. 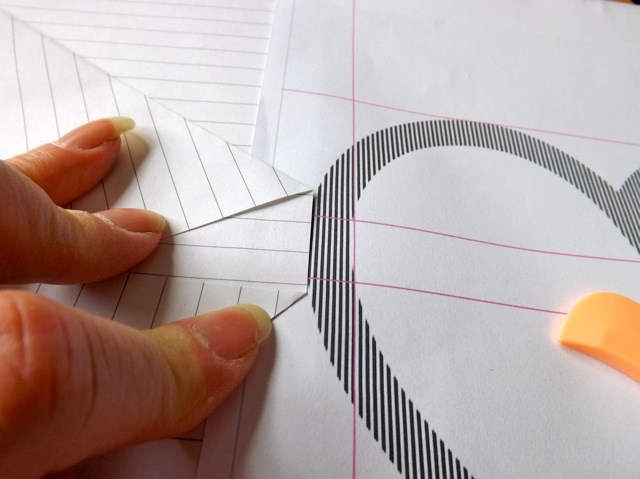 I’ll send it but I think you might struggle with the thin lines of certain letters – I might send a fattened up version as well and you can test fold a letter from each then pick which one you prefer! Watch for it…. Hi Maryanne! I absolutely love this and would like to craft one up for my cousins wedding. Are you still doing these? could I please have one that is like “J (Heart) K”? Hi MaryAnne. I love you tutorials! I want to do something for my mother for Mother’s Day. I would love for it to have “Mom” and maybe a heart or flower with the design. I can’t seem to find the perfect idea, but I just know you have something in mind! Thank you. When your doing more than one word such as merry xmas and merry is on top of xmas how do u do it? That is very complicated. 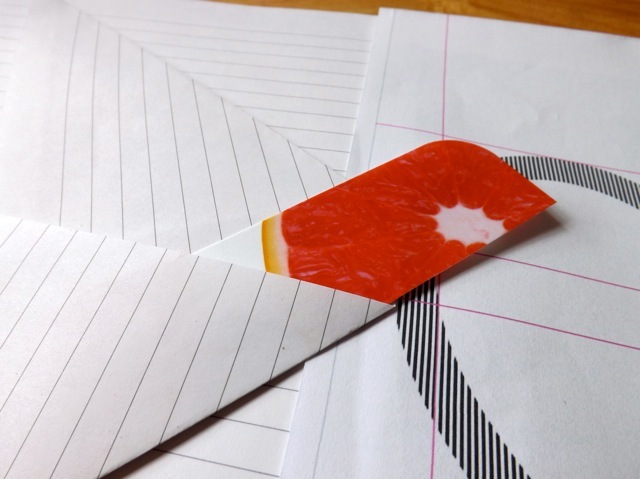 You need to divide the book into sections and slice the pages to create a top section and a bottom section then fold the words one in each section. I have seen videos that demo it, check for Bookami on You Tube and you might find newer ones ore different ones to the one I linked here. 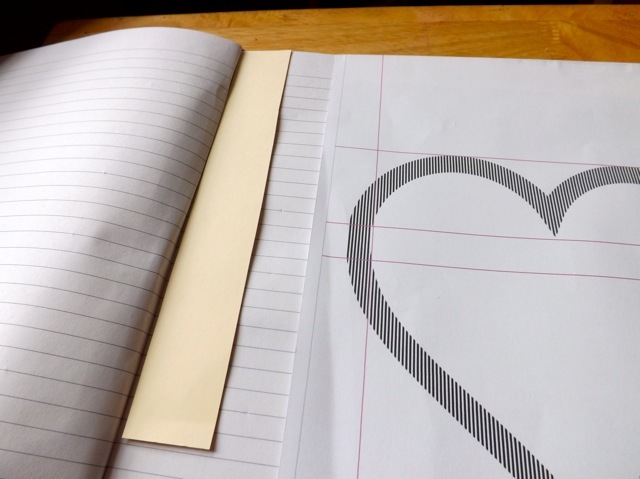 i folded one book in a heart with the word MUM…. it was fun doing….. i am looking for free patterns. do you know of any available. would love to do one for my grandaughter, IZRA. Also in a heart shape. Not 100% sure I understand but I’ve sent you one. See if it is what yo are looking for! Hi. Can you please make a template of the word “Steele” The book has 432 pages. If possible, can the font be Iowa Old Style or something around that if that’s not possible. Thank you soo much. I’ve been looking for templates for days. Once again, thank you. Much appreciated! Yes, although the help is limited. I can provide a template but you have to count the lines and calculate what size book you need. As to tutorials, I would say look at YouTube. I’ve linked a couple in various places but there are new ones every week so a quick search for book folding might turn up something great, you never know! Can you please send me the word “Daisy”? If possible, could the font be a calligraphy style (cursive, but not over the top if you know what I mean!) Thank you very much! You’ve been a big help in my quest to start the book folding craze. Why is it so difficult to find patterns? You are so generous to offer help. With that said, could you please send “Ashley” in a script font & “Friends” in something bold. Fonts of your choice…. It doesn’t really work that way. You print the template then count the lines to calculate how many pages you need then find a book that fits. 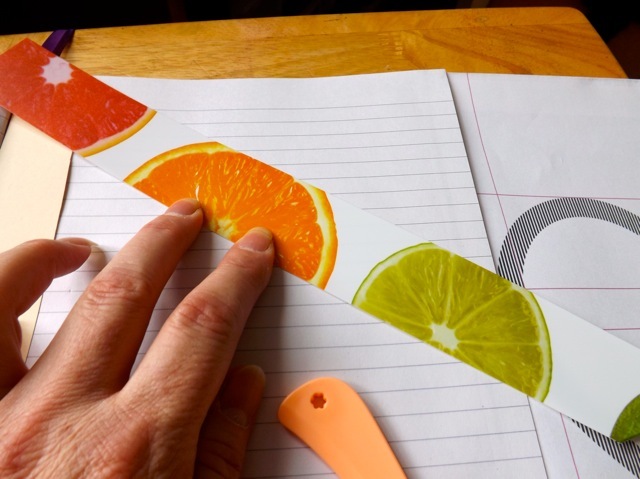 You can’t alter the size of the template unless you are printing an image on the lines-only sheet. Hi there, I am loving book art and would love to give it a go. Please could you tell me how I can make my own templates. I have seen software online but is it any good? I am a teaching assistant at a primary school and I would love to make one for our class book corner with the name of the class ‘Robins’. Thank you in advance of your help. I use a program that no one else does, and it isn’t a book folding one specifically. I’ve heard of one called Bookami that is meant to be good but I think it is the measure and mark method. I can make you a lined template for you class name, but a font style would be helpful! Thank you so much, I will look into that. Thanks for the template, I will leave the font up to you, whatever you think is easiest for a novice! Nope. That isn’t the style templates I make. Sorry. I know there are people who can do that for you, for a fee. I don’t know anyone personally but I do know there are a couple of people on a Facebook group that might do this. I’ll have to wait till I get to a device where I use FB, or just search book folding groups and a bunch will pop up! Are you willing to pay for a template? Please could you do me a couple of templates? Aela for my daughter and Terry for a colleague that is leaving soon. Did you reply to my email asking if Terry was male or female, for font choice? Did you receive the other template? This is exactly what I’ve been looking for. Would you be able to send me D♡D. Would love to surprise my husband for our 1 year anniversary. I also love how the word is bigger from top to bottom of the page if thats possible too. The bigger at the top illusion is the folding and nothing to do with the pattern. The word on your sample image is placed further down the page rather than smack in the middle of the book. 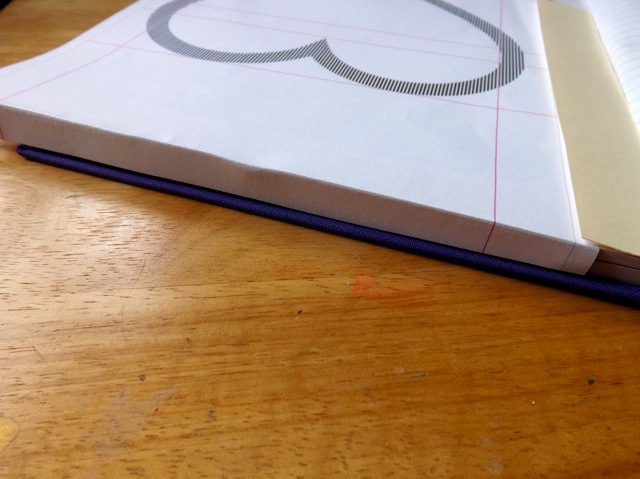 To get that effect you just need to add a piece of cardstock with a lip folded at the top (to hook over the top edge of the pages) then stick the printed template to that in whatever position you like. That goes for any template I send 🙂 especially when there is more than one on a sheet! And yours are on the way…. Would like a template for the word “friend” all lower case in the font habano ST. Thank you. Hi, I’m not sure if you got my last message as it doesn’t seem to have appeared in the posts?!! I love your tutorial which is easy to understand and makes sense. I was wondering if you were still doing templates for people if you could do AMELIE and EFFIE in a script type writing. Also, would you be able to give me an idea of how many pages I would need and roughly the size of the book please? Thank you for your tutorial which is the first one I have been able to understand!! If you are still creating templates would you be kind enough to do one for Amelie and one for Effie in the script type font please? Also do you have any of what book size and amount of pages required? I don’t have a computer at home …well I have a very old computer, so I’m forced to use the library. Now, I’m hoping you could still help me out! I would like to make one that says “Mr & Mrs” and I’m assuming the library has Microsoft Word and would allow me to download it somehow. Id like it to be a fancy font but not so fancy that it’s really hard to do! 🙂 What size book would I need? I have various sizes, up to about 700 pages. Is that long enough? Thanks for your help!! Oh WOW… there’s a lot of intricate work going on right there… KUDOS to you! Could I get a templet of RRC, with the middle R being a little bigger. It is for a wedding gift so any font will do. Thank you so much. I just found your site while looking for articles on book folding. I would like to attempt to make one for my boyfriend. I’m not sure if you are still making templates but I would love one for “B♥L”. I find this very interesting and would love to give it a try. My grandsons love football but they each like different teams, is it possible to get a pattern for the “Steelers ” and one for “Eagles” I would appreciate it so much. Thank you for sharing. Hi I’m new to book folding but I’d love to try the word faith if you have any templates. Thank you for the breakdown of instructions they have really helped 😀. Thank you I’ll let you know how I get on. Hi Maryanne, could you make me a template like this http://janicu.files.wordpress.com/2011/02/dream.jpg or something similar? If you could I would greatly appreciate it. Hi Maryanne, could you make me a template that looks like this book http://janicu.files.wordpress.com/2011/02/dream.jpg or something similar? If you could I would greatly appreciate it. I have made a template for writing my name, which contains some open letters. I have read different advice in various places about what to do with these and wonder if you might be able to give me some guidance….. When you have two bits of black on the template and you do the top section on fold 1, do you move the template to the next line and then do the bottom section on fold 2, or do you leave the template where it is for doing the bottom section and only move it to the next line on fold 3? If I’ve understood your instructions above (which are great btw), you do both fold 1 and fold 2 for the top and then the bottom sections BEFORE you move the template to the next line – does this not mean that your open letters would be distorted in comparison to your non-open letters? But if you move the template between the top and the bottom fold, then you are only getting every other line? From what I understand (and what works for ME) is that you alternate the folds and do not move the template. It does work. One thing I have seen a lot of is S T R E T C H I N G the word, so it takes up more space lengthwise but NOT altering the height. If you look at the JOY book, it has lots of alternating folds. This was a short book, so I wasn’t able to stretch it, and the letters are a bit thin, but readable. I am reading what you wrote and I am not sure if you are understanding – but it could be my reading of it too! Lets take an S as an example. There is the top of the S, the middle curve, and the bottom curve. If you place the lined template under three pages of the book and DON’T move it. On the 1st page, fold the top of the S. On the NEXT page, fold the middle line that is on the same vertical. On the 3rd page, fold the bottom line that is on the same vertical. Shift the template to the next vertical line (of three parts) under three more pages, and fold those, top, middle and bottom, one a page. If you check YouTube I am sure there are some book folding videos that show alternating folds. Do get back to me if this isn’t clear! Thank you – I have understood your reply. I will give it a go and let you know how it comes out! Thanks again. I wanted to make a folded art book for my husband, it is our 1st year anniversary. I was wondering if it’s possible to make a date 2♥14♥15? Also how many pages book should I get for design like this? It will be my first time trying this. I am very excited! Thank you for making tutorials, you are truly a life savior. Have you looked at the PDFs of templates I added? There are a couple of hearts, and some other simple images that would work for what you are looking for. Happy to send you a RYAN one if you will give me an idea of the style font you like! Watch for it in your in box! Hi would it be possible to do a ’90’ please and also 16-02-26, I don’t mind what font, as long as it’s clear. This is a fab idea, new to this but really looking forward to having a go. Hi Maryanne, Im trying to do this as a 1st anniversary gift for my wife, could you please help me with two templates the first one should say (Mariana) with a girly font like Habano ST a (small heart) in the middle and (Jonathan) in a masculine font please i think i would use a 800 to 900 page book, and a second one with a date but hinted of a dot a small heart in between the numbers 04hart21heart15 and i would use a 400 to 500 page book. I would really appreciate the help and advise on the amount of pages and just some nice not so complicated fonts pls. thank you very much. Hi Maryanne, Im trying to do this as a 1st anniversary gift for my wife, could you please help me with two templates the first one should say (Mariana) with a girly font like Habano ST a (small heart) in the middle and (Jonathan) in a masculine font please i think i would use a 800 to 900 page book, and a second one with a date but hinted of a dot a heart in between the numbers 04hart21heart15 and i would use a 400 to 500 page book. I would really appreciate the help and advise on the amount of pages and just some nice not so complicated fonts pls. thank you very much. Hi Maryanne, Im trying to do this as a 1st anniversary gift for my wife, could you please help me with two templates the first one should say (Mariana) with a girly font a (small heart) in the middle and (Jonathan) in a masculine font please i think i would use a 800 to 900 page book, and a second one with a date but hinted of a dot a heart in between the numbers 04hart21heart15 and i would use a 400 to 500 page book. I would really appreciate the help and advise on the amount of pages and just some nice not so complicated fonts pls. thank you very much. hi! i’d love to try this, i want to give something unique for my friend, can you send me a pattern of a date 01-25-14 thank you! i live your blog! Looking to get a template for Victoria my great niece was born today and I’d like to send a beautiful treasure like this to El Paseo TX from Philadelphia PA…please any suggestions of where to purchase the template would be great. Happy to send a template but could you suggest a font? Or at least a style you like? Hi, thank you for the wonderful tutorials and patterns. I was wondering if you could send me a pattern that says Nick – Michelle and put a heart between their names. It is for my son and his fiance. They are getting married in August and I would love to make them a book. Also if get some spare time could you do one for my daughter please? Her name is Abbey and it is spelled with an E in it. No rush on hers. I really appreciate it and I’m hoping someday to get photoshop so I can make my own patterns. Oh I’m hoping you can help me! I have been trying to create a pattern for myself, but I’m having absolutely no luck! I am trying to get a pattern that says “Always” and then the symbol from the book Deathly Hollows (from Harry Potter). The pic is basically a triangle with a circle on the inside. It can be found numerous places through a google search. Is there any way you may be able to do this? I want to use the actual Deathly Hallows book, which is 750 pages, and (crossing fingers) should be good for a larger/longer pattern. Thanks so much!!! I think I’ve done it 🙂 Check out today’s blog post for some more detail, but I will mail you the PDFs. It was an interesting one 🙂 and helped me explain why I don’t do the counting for people LOL! I would appreciate it so much if you could make me a template for G&L – my friend just got engaged and these are the initials 🙂 In regards to font I would like something quite ‘romantic’ but still would look good for folding (so nothing with 4/5 interuptions). I have included my email for you, thanks in advance! Sorry to the few people who have been waiting! My email server has been down for days and is only just now back up. I will try to get to the requested templates as quickly as I can. I can do that if I can find a file .svg that suits you – what feel do you want? Cute or realistic? How kind and generous of you to offer these patterns. 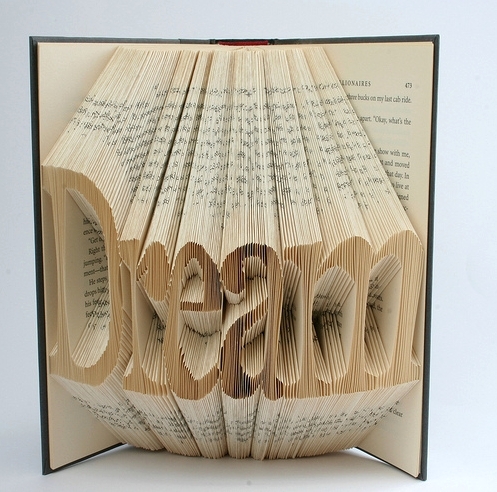 I would love to give this method of book folding a try. Could you do me the name Caitlin please (capital C) in a “girly” font. Thank you for you time. How generous of you to create patterns for people such as myself who have no clue how to create a pattern!!! If you could make one for the name Caitlin that would be great. A “girly” font would be great. Hello! would love to give this a try … I have two separate books I would like to make…first one is just for the letter “G” book is 650 pages and is 6.5″ wide and 9.5″ tall. second book is for the letter ‘M’ book is only 255 pages 5.5″ wide and 7.5″ tall. don’t care on the font style..whatever you think will look the best. Appreciate all your help! hi! These are amazing – please may I get the word “Home” with a heart as the O? For my brothers new house. I don’t know if you do images – but my brother and wife are having a baby girl – so if you have any templates that could represent that too? Thank you so much would be greatly appreciated! I would like one that says READ and I have a book that is about 584 pages…Thank you so much! Merry Christmas, Kwanza, and New Year! 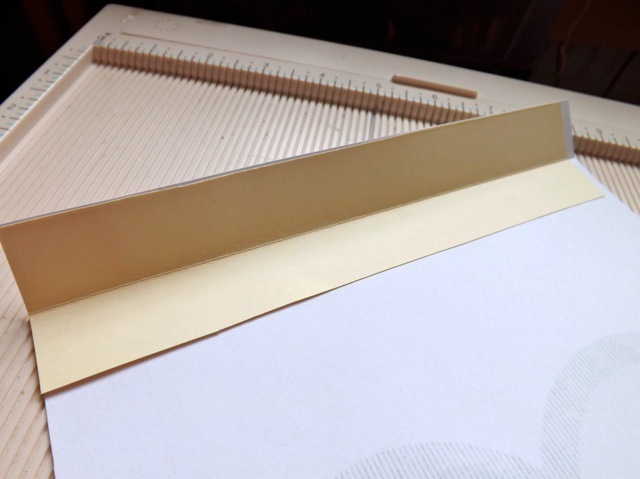 Are either of the templates in this post https://scrappystickyinkymess.wordpress.com/2015/12/11/book-folding-templates-by-request/ suitable? There is a more simple font and a more scripty one, and if you use both the black lines AND the white spaces between they might fill a book of that size. Alternatively, feel free to comment with a specific font and I’ll see if I have it or can get it for free. Thank you so much! The script one works well. My daughter is getting married and I would appreciate a template for Jones. Since this is my first attempt, probably plain and simple, medium size. Could I get the word Joy in block letters. Capital J, lowercase o and y. I am making 4 of these on books that are 450-650 pages. I am thinking that should be enough pages to do folds on the white lines as well as the black ones. Would that be the right assumption? I sometimes like to begin in the middle and work out – that way if your calculations are off you have the same number unfolded pages at the beginning and the end! Also, for short words in long books, use the BLACK lines and the WHITE lined between for the folds, so the word is nice and fat. I usually test a letter each way on a cheap paperback (black lines only, white AND black lines) and see which I like better! Sorry I got my email wrong, its … and could I have the word bacon in plain/simple medium sized lol sorry to be a pain. Hi are you still doing these??? I’m in an emgergancy!!!! I’ve just been asked to do a book fold with the word BACON (lower case) could you help?? Hello, I am very interested in this craft! Could you make me a template of “Ryan” and “RTM” ? Please just plain/simple/big/bold? Also as you are doing a few, all the same or each one different? 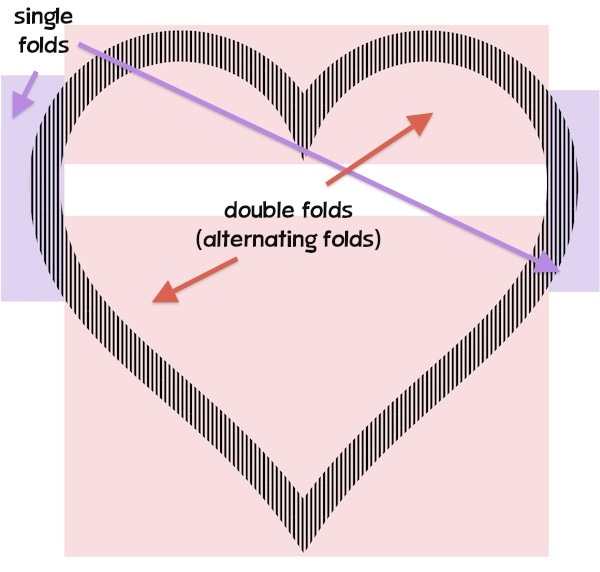 Hi Maryanne, im new to book folding ive done the heart and it was a good attempt quite pleased with myself. Would it be possible for you to do the names Jade for one and Bradley for another one. Thank you for your time. Happy to, but can you suggest a font, or at least a font STYLE that you prefer? Plain and simple? Big and bold? Scripty and flowing? Same for both names, or different? Thank you for the patterns they are just right. I don’t know much about fonts, I will be starting these tomorrow ready for Christmas. Thank you for your time. Do you sell your templates or how does that work? I would love to get a bunch of templates done. Thanks! Went back and found the section about number of pages. I came across one of these books recently and it looked very effective. I should be really grateful if you could let me have a template for 80th and I’ll have a go for my Dad’s upcoming birthday. Could you send me a feminine font (nothing too fancy) for Gracie and one for Kenzy? And could you also tell me how big of book I would need for each name approximately? Thank you ever so much!! Wondering if you want them to MATCH or be different for each! Will send a couple…. Thank you for this site, I look forward to learning and crafting with you and all the other members. I realize these are both from you 🙂 What I need to know is which is the dominant letter? Usually, with monograms, the last name initial is in the middle, bigger. If I am doing that I need to be sure which is the last name one! I’m sorry for posting twice, I didn’t think my first post was successful. First name P . Middle name L. Last name H. H is the dominant letter. P H L Thank you so much. I’s so excited to start this project. I love your site (the placemat idea was genius) I was wondering if you could make me the name Emma. Thank you so much for taking the time to do this for me. I’ve enjoyed reading through your site. I love that you are helping this way. If possible could you do me a template for Ruby. Some sort of flowing but chunky lettering. My 1st grandbaby 😊. Also, some idea how big a book I would need. It’s great that you are offering to do the patterns for people. Could you do the name, Shona , please. Hi, I think its fab what your doing here 🙂 thank you for sharing your talent , Please could you do me a stencil with the word lilsis and a small heart at the end? I would love to try one of these to give to my wife for Christmas. If you would be able to make me a template for “love” but with a heart in the place of the “O” I would be so grateful. How many pages long should the book be? I love this idea!! and thank you so much for the instructions. I love this idea! Please may you make a template of a heart and another saying READ. This would be amazing! Thank you. I would to have a go at this as I love to read! Would you please be able to make a template for me of a heart and another saying READ. It would be greatly appreciated. Thanks. I would love to do this for my first grandbaby due soon. Can you do the name Jameson? Thank you so much, this is so very kind of you. Is fun doing this but cant makr my own patterns which make it difficult. I am unable to make the patterns by myself. Could you please help me with patterns for the word “Aadya” and “AVANTIKA”. Thanks a ton 🙂 I go your email. Hi again, i hope you don’t mind, I would like another one because i don’t know how to make these myself… It’s my friends birthday next week and I’d love to give her one of these. Could you please make one with — Emma — on it? thank you so much!! Could you do something that says “Elena S.” on it as soon as possible? Thanks so much! Hi! Can you please email me ” I (heart in the middle) you ” and ” Love “. Thank you so much!!! Hi I would love to do Erin with a heart, its for a Baptism. Thank you!!!! I would very much appreciate it if you made me a template. Amanda and in a font that kinda looks cursive, you can pick the font. thank you so much!!!! the book i have to use has 488 pages in case you need that. I’m in hospital at the moment so it’ll be a few days before I get back to you! I think I can do it, my daughter is due in a few weeks, and would love it if you’d please send me the template for Charli. Thank You!! I would, but you haven’t left me an email address to mail it to. Can you either email me or leave your email here? my email is wallspenny@virginmedia.com, thank you soooooo much again. I have emailed you a couple of times, with attachments and without, but never had a reply. Not sure if your email is blocking my emails but wanted you to know I did TRY! My fellow coven member folds books….does my head in as I struggle to visualise it! Plus I am rubbish with straight lines so don’t think mine would look like anything! !